Siracusa/Syracusa's Ortigia/Ortygia is a little walled peninsular town perched on top of the turquoise waters of the Mediterranean Sea. It's characterized by tiny, winding alleys, beautiful limestone public squares, an ancient history, lots of university exchange students, and the friendliest locals. We stayed here in Siracusa and loved the location, their lovely dog friendly attitude, and their sunny seaside breakfasts! ...and some Doric Greek columns - in the walls of a church! Siracusa was the loveliest place to relax for a couple days. 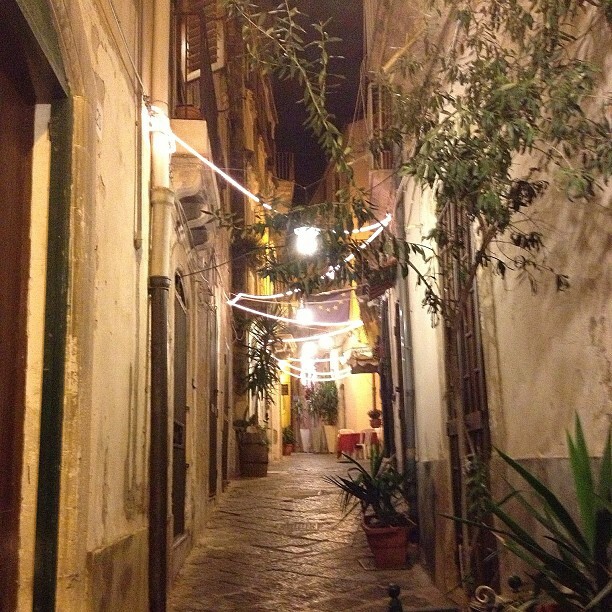 We ate dinner both nights at a lovely little restaurant whose name I can never remember, up this adorable alley. And walked the dogs through the Oritiga's streets and squares for hours. It was just before Easter, so the bakeries were full of marzipan treats. And the rough seas that cancelled our ferry crossing back to Malta (which is why we got to stay here two days - no one was complaining!) turned the sea a milky turquoise colour. The Ortigia is for wandering around, camera in hand. Sitting at a cafe drinking Bloody Mary's and reading a book. Popping into artist's studios to admire their work. Picking up souvenirs (Modican chocolate, notebooks, biscotti, busiate pasta, and hot pepper jelly, to name a few) in the Ortigia's lovely shops. Listening to the waves crash against the city walls as you fall asleep. And apertifs on the house after every meal. What a fun opening shot! How lovely to live on Malta... I fell in love with the island a few years ago during a 4-day weekend trip. We're hoping to make it back again soon as I didn't have enough time to get to Gozo. Was obtaining a residence permit there a challenge? It was a challenge, and if you're a non-EU citizen you have to renew your permit annually, so it remains a challenge for awhile. Best of luck! Student permits do make life much easier. UM undergard courses last 3 years, and postgrads are 1-2. You'll both get a residence permit each year if he studies there for the full duration of his studies. I've been at UM for a total of 2 years now (1 year as a transfer undergrad student, 1 year for a Master's program) so I'm happy to lend advice if he needs it!